About Matt Potel — Matthew Potel Foundation, Inc.
Matthew Daniel Potel was an extraordinary individual who always wore a charismatic and friendly smile. He brought joy and confidence to all those he met with his exuberant energy and caring attitude. Matt was wise beyond his years, an excellent student, and a very loving son, brother and grandson. He was lucky enough to find his life’s passion as a young teenager. Matt found peace and happiness in the natural world, and was trained in wilderness and leadership skills at the National Outdoor Leadership School. He generously shared his love of the outdoors with countless friends at his beloved summer camp, Pok-O-MacCready. This camp is also where he became a 46er, meaning he hiked the 46 highest peaks in the state of New York. As president of the Binghamton University Outdoors Club, Matt was able to help others find the beauty of our earth. 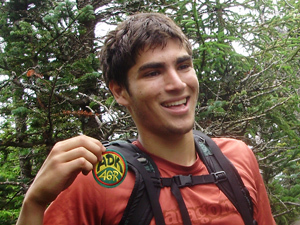 Matt’s tragic death occurred while he was doing exactly what he loved, hiking in the Adirondacks with his University club. As he was assisting his friends across a dangerous ravine, he slipped and fell and died a hero. There is no place that Matt would rather end his time on this planet than in the Adirondacks mountains, surrounded by his friends and the nature that made his life so bright.